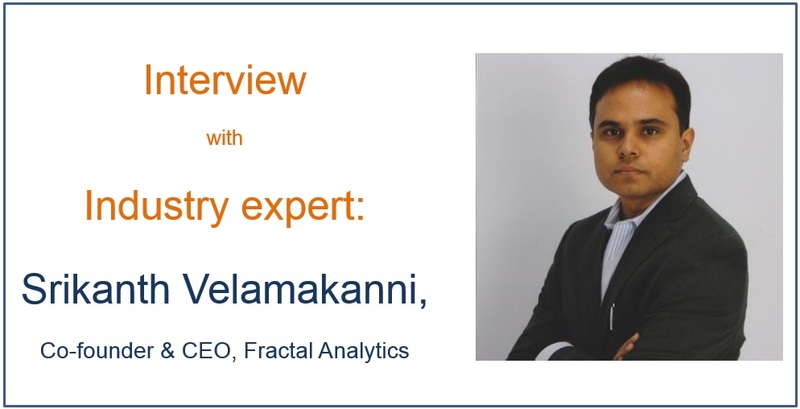 This is third and concluding part of the interview with Srikanth Velamakanni, Co-founder & CEO, Fractal Analytics. In the first part, Srikanth shared how Fractal came into being, and how they overcame the initial challenges they faced. 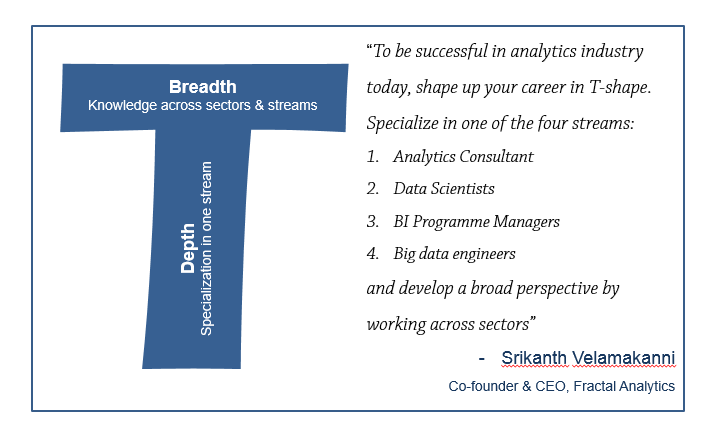 In the second part, we discussed how Fractal manages the career cycle of analysts at Fractal (hiring, training, engagement and attrition), and the challenges that occupied Srikanth’s mind. In this part, we will discuss the key strategic bets Fractal foresees in the next few years, and how Srikanth sees the industry evolving. He has also given some career advice for people in this industry. KJ: What are the strategic bets for Fractal in next few years in terms of tools, people and infrastructure? The biggest bet from a vertical perspective, is entering new sectors. We are currently focussed on consumer packaged goods and financial services. We are now foraying into analytics for technology and life-sciences as well. In terms of tools, we have placed some big bets on creating an internal environment where people can work in an error free environment. These tools are based on visual workflow and hence ensure quality by making sure errors get flagged in the process flow. Another big thing for us is the entire area around human-machine co-operation. This is an exciting space. For example, take data harmonization problem => Data comes from different sources in different formats and with different context. Machines can’t match these sources accurately and human led interventions are very time consuming. The solution is to create algorithms where machines take care of maximum matching and humans intervene only to deliver on last mile challenges. Another question we are constantly thinking about is “How to simplify front end for a complex back-end?” Our customers are business users and need not know all the complex algorithms running at the back end. For example Google has a simple interface to search which is enabled by very complex algorithms at the back end. We aim to achieve a similar outcome for our products / services. SV: We are already processing things on distributed systems using some of the latest platforms like Hadoop and MongoDB. It is still a small team and we are handling data in magnitudes of terabytes. We are not processing petabytes of data yet. This is something we are building. Goal to have a system which can handle at least 1 Petabyte of data by end of this year. KJ: If you were a fresher starting in analytics industry today, how would you shape up your career? SV: My advice would be to take up a career track and be clear in how you would be successful in it. There is a lucrative future in all the four specializations we talked about. And like any other science, this industry will also move from generalists to those having a super-specialization. So analysts should ensure that their career moves in a ‘T’ shape. They should have deep knowledge in at least one domain and have a broad perspective about the overall Analytics industry at the same time. At younger stage, people should be willing to move industries and learn quickly. People wanting to become Analytics Consultants should gain business knowledge of their domain. They can’t succeed until they understand the domain completely. BI experts should understand how all the tools work. While the tools may change over time, the knowledge about them will eventually make you a better professional. This industry is set to boom for the next 40 – 50 years. It is something like joining the IT industry back in the early 80s. This is a dynamic space with lots of opportunities. Any big company in this space can go out of business very soon because of the fast pace of the industry. But as long as you have the right talent, you have a bright future. KJ: Any advice for Analytics Vidhya’s Audience? SV: For people who are trying to switch to Analytics as a career, my strong recommendation would be to develop an understanding of probability and see if they are enjoying it. They have to take pleasure in understanding probability, to be an analytics professional. My suggestion to them would be to look up AI and Machine learning courses on Coursera. They are really good courses. Then they should see if this is something which excites them. For professionals already in the industry, I would suggest that they learn continuously to build their career in a T-shape, like I just described. The other thing they should think about is, ‘which is the right Organization for them to join?’ And where can they build the required skills? This choice should not be based on their location. They should look out for the right company, the right culture, where they can spend 10 – 15 years of their career. I have seen youngsters tend to be a bit restless and they switch many jobs for pay and designation. I think pay is not as important and if you have the right skills and are in right Organization. The pay will eventually catch up. KJ: Thanks a ton Srikanth for the quality time you spent in discussing these questions and providing your perspective. I think it will go a long way to help audience of Analytics Vidhya. Part 1 describing how Fractal started, initial challenges and how they were overcome? Part 2 describing how Fractal manages hiring, training, engagement and attrition of analysts. I think all the information / perspective provided by Srikanth is invaluable. There is tons of useful advice in these 3 pieces of interview. Over next few days, I’ll continue to reflect on what I have learnt by talking to Srikanth.